Darby and Toby's puppies have arrived. There are four apricot boys, one chocolate girl, and one black and tan phantom girl. They will be mini and medium in size. We believe two of the apricot boys will mature to be large miniature size adults, approximately 17-18 inches at the shoulder and weigh around 27-32 lbs. We believe the rest of the puppies in the litter will mature to be miniature size adults, approximately 16-17 inches at the shoulder and weigh between 20-25 lbs. Week Four ~ ​for more weekly pictures of these adorable pups, click on Weekly Puppy Pictures button. The puppy stork has arrived! Please join us in welcoming Tally's puppies! Tally had two honeymoons. She had one honeymoon with Flynn and another with Beau. But the heavy white markings, such as their white chests, white paws, white on their faces, lead us to believe that Flynn is their father! We will confirm our suspicions via DNA testing. We know the parti-colored puppies were sired by Flynn as Beau cannot produce parti-colored pups. Tally's family of seven arrived on Friday, April 12th. There are three male puppies and four female puppies in their litter. ​Week One ~ ​for more weekly pictures of these adorable pups, click on Weekly Puppy Pictures button. Emma and Ryan are planning a honeymoon. If they are pregnant, we will expect standard size puppies in colors of Chocolate and the rare Lavender color. Stay tuned. 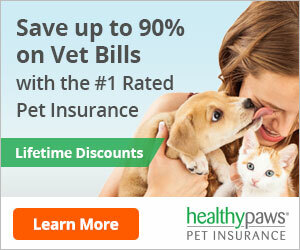 Healthy Paws Pet Insurance was voted the #1 Pet Insurance for 2018! Florida's Premier Australian Labradoodle Breeder. 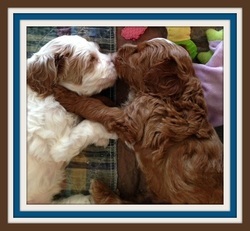 Florida Breeder of Allergy and Asthma friendly mini, medium, and standard size Australian Labradoodle puppies. All of our breeding dogs are health tested to the GOLD PAW standard of the Australian Labradoodle Association of America. Our Labradoodle puppies come in all coat colors - Red, Apricot, Cream, Chocolate, Cafe, Lavender, Chocolate/White Parti, Red/White parti and Phantom and coat types - curly, wavy or straight fleece, and wool. Two locations in Florida - Tampa Bay area on St. Pete Beach near Clearwater, Tarpon Springs, Hernando, Ft. Meyers, Naples, Miami, and central Florida near Ocala, Jacksonville, Orlando, Lakeland, West Palm Beach, Ft. Lauderdale, Miami, The Villages and everywhere in between! We have puppies in Georgia, Alabama, Mississippi, Kentucky, Louisiana, South Carolina, North Carolina, Tennessee, Kentucky, Virginia, West Virginia, Missouri, Indiana, Illinois, Texas, Arizona, Missouri, Oregon, Colorado, California, as well as Germany, Japan, and Canada. We serve all states. Shipping is available if buyer views puppy at Breeder’s home, designated location, or has a proxy view puppy on their behalf prior to adoption.